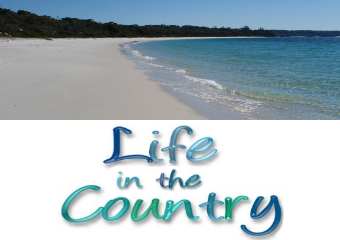 So excited I am about blogging again, I am scheduled out a couple of weeks in advance. You are reading this in August but it was written on the 28th of July. :) YAY me. 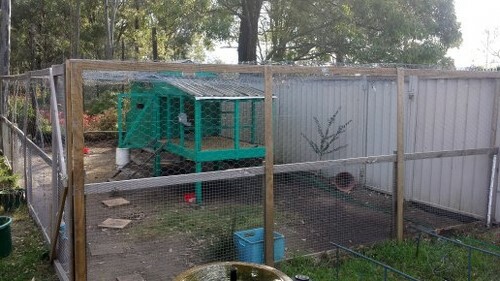 We have just had a huge weekend of chores and jobs, and the first one on the list was clean out the chook pen and enclosure. 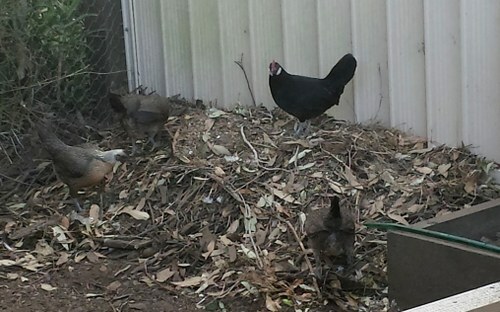 The raked up leaves, branches, and assorted biodegradable chook leftovers. So the people who have the block behind us have a lot of trees and while it is lovely to look at it means a lot of leaves, branches, gumnuts, and associated tree junk end up in the chooks yard. The chooks do not mind this because these leaves will often hide little yummy insect friends, so the leaves are really a constant entertainment to them. They spend their days turning the leaves over hoping for a treat. I mind, because it looks messy. But in keeping chooks you soon learn you have to give up on what you want, it is all about what the chickens need and want. Over winter there is not much point trying to do anything about it. If I rake it all up guaranteed the next week there will be strong winds and it ends up just as messy as it was before. 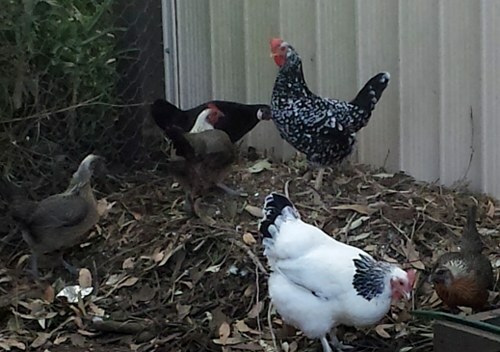 So yesterday I did rake and made a lovely pile in the back corner which will be left to biodegrade – that is if the chooks can leave it alone long enough – and there is now a strong wind warning for our area. Of course. And clearly, there is little chance of the chickens leaving it alone for very long. If you move something to a new place, it suddenly becomes fascinating and exciting and must be explored, pecked, scratched, and not left alone until every possible treat has been exposed and eaten. Little Kitty looking in – why can’t I be in there? Well, little kitty is not used to chickens yet. She thinks they are great fun to chase. 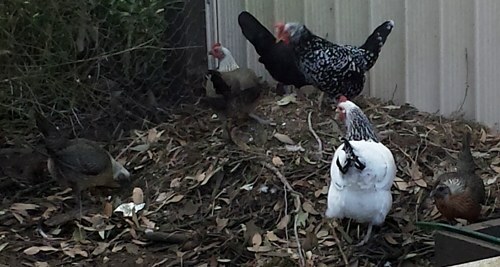 The chooks respectfully decline this, and gave her several decent peckings to convince her they are a formidable force. She does not seem to mind and continues to chase. I will slowly teach her this is a bad thing, over time. At this point she’d got annoying and the chooks were clucking and tut-tutting her, and there was even a few wing flaps and bagerking in her direction, so she was sent back to the regular yard for my sanity and for her own safety. 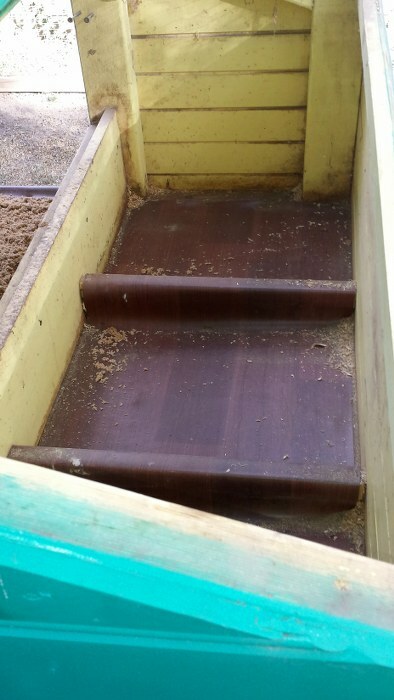 Usually we will clean out the coop in the last week or two of autumn, and then leave them be other than occasionally scooping the poop out of their coop, throwing them their many treats and collecting any eggs. 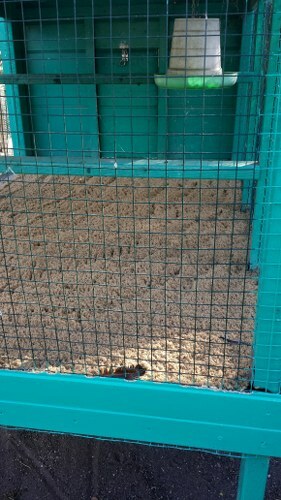 You can’t be so lax in summer because in the heat the poop gets quite smelly but in winter you can leave it a few days – some people actually leave it the whole winter which is perfectly ok – they use a system called deep litter. Long story so google it if you want to know more. 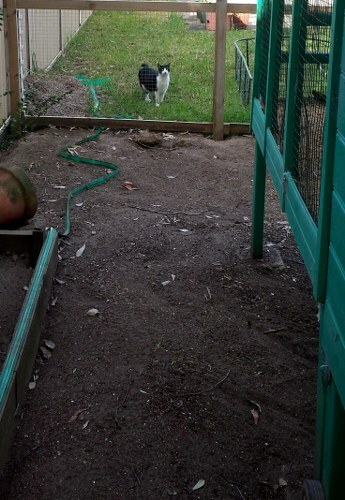 The chooks laying area cleaned out. 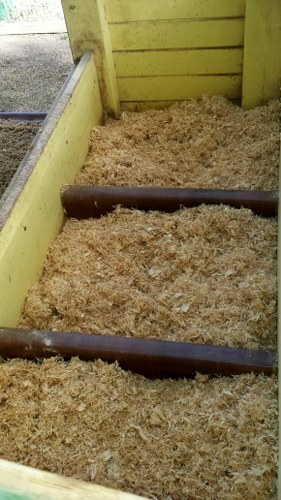 The chooks laying area with fresh new wood shavings. They will make some very fascinating circle shaped nests in here. I will have to remember to take a photo. One thing I do not clean out is the spider webs. 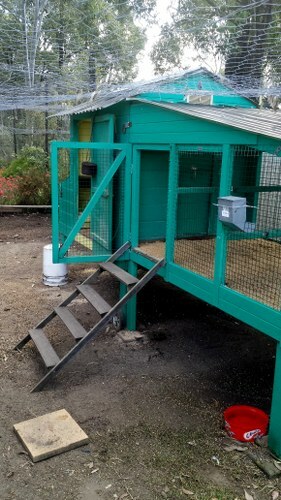 There is only one place (in my mind) where a spider is welcome and it is within the chicken coop. If they can survive the pecking beaks of the chooks, they can eat a multitude of flies. If I spot a poisonous one I do usually squish that because I’m none too sure on whether they are poisonous to chooks or not. The girls hanging out, here are a couple more shots. :) Happy moments for my girls. My Angel Boy would love that enclosure with the little green house inside! His very own cat mansion! 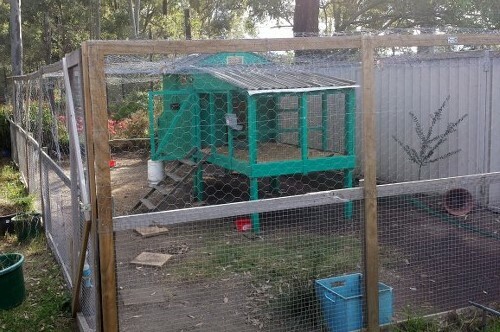 Have you thought of growing a green crop in the enclosure for the chickens to forage in? Perhaps spinach or silverbeet? A little patch of wheat grass? 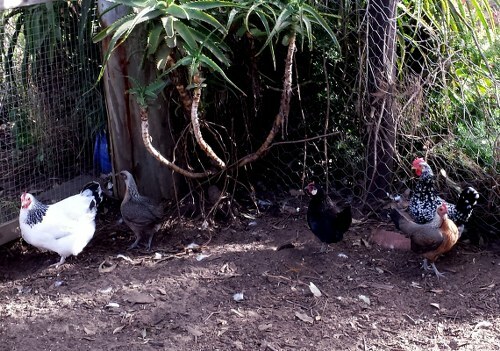 There were plants in there – plants chickens do not like to eat. 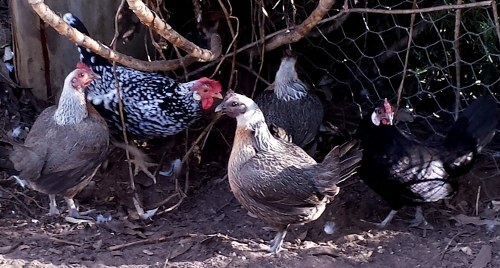 However, that did not stop them pecking at the soil and roots of the plants which killed them off fairly quickly. I was only thinking of you the other day. I got an email to please remove a link notice about a scam post of yours I re-posted years ago. I adore your chicken coop – egg plant ! I cannot wait to build ours . I learnt quite a bit today.